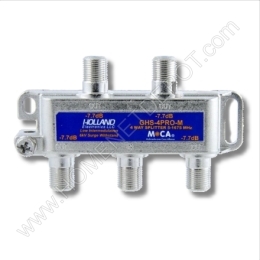 The Model GHS-4PRO-M, Holland Electronics’ 4-way equal signal loss horizontally ported broadband splitter provides an excellent RF signal path for analog and digital cable TV and off-air signals. While providing intended bandwidth to father enable MoCA (Multimedia over Coax Alliance) home networking technologies to co-exist on the same coaxial cable media with DOCSISTM compliant cable modem applications. Device therefore can allow the distribution of MoCA data transmission technology throughout a dwelling utilizing the existing coaxial media wiring. Design allows co-existence of Cable TV type programming, networked DVRs & computer accessories over the MoCA network stacked on the same coaxial cable. Low port to port isolation at the MoCA frequencies. Standard broadband cable TV splitters have an operational bandwidth from 5-1002Mhz. MoCA home networking operational frequencies are 975-1650Mhz. The extended bandwidth passives’ frequency allows MoCA data streams to transmit and receive in a protected upper frequency band. Tin-plated, zinc die-cast housing with soldered back plate provides -130dB of RFI. All are highly precision machined with SCTE compliant flat ended "f" ports that are machine threading and are spaced on 1" centers. All ports are water sealed and have be tested to withstand 30 psi of internal pressure. All ports comply to all existing SCTE standards. Built-in NPO capacitors on all ports. All components are temperature hardened. Devices designed to remain stable in environments of -40 to +85o C and maintain all technical specifications. INPUT PORT SURGE - Pass 6kV 3kA combination wave surge test. As defined in special magnetism resistant ferrite core material allows ferrites continued operation within designed specifications when high RF levels are applied. OUTPUT PORTS SURGE - Pass 3kV 100A @ 100khz ring wave surge test. As defined in IEEE C62.41.1991 for cat A3 type device. NOTE; This device IS NOT INTENDED to be applied to ANY SATELLITE DELIVERED APPLICATIONS. This device IS NOT configured to pass AC or DC voltages.